“Want More Easy Eyewear Earnings?” Online Training Available! 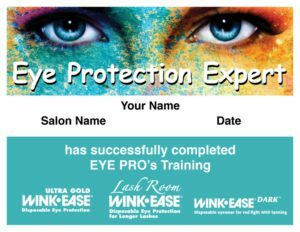 November 2018 – EYE PRO, Inc., world leader in disposable eye protection for indoor tanning and makers of Ultra Gold WINK-EASE, Lash Room WINK-EASE and WINK-EASE Dark, wants to make sure salons and tanners understand the dangers of not wearing proper eye protection when tanning. 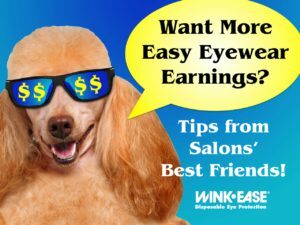 Comments Off on “Want More Easy Eyewear Earnings?” Online Training Available! Having spent 27 years in the tan biz, I can say that most salons don’t know the regulations for tanning in their state. I’m going to cover state eyewear regulations; but if you don’t have a copy of your state tanning laws and are following them, email Brenda@WinkEase.com and I’ll send you the latest version. Salons in New Hampshire are also prohibited from offering shared goggles. Goggles cannot be altered in any manner that changes it from the manufacturer’s intended use, such as removing elastic straps that are included in the product packaging. The salon must sell tanners eyewear or provide disposable eye protection. Iowa is my favorite: eyewear can- not be reused, it can’t be altered, and your staff must ask to see a tanner’s eyewear before they enter a tanning room. In addition, the salon must provide disposable eyewear in the tanning rooms at all times with a sign posted stating that it’s available and must be worn (whew!) I consider Iowa’s law to be excellent! It ensures that the tanner shows that they have eyewear, but still has access to clean eyewear in the tanning room. Comments Off on Do You Know Your State Eyewear Regs? 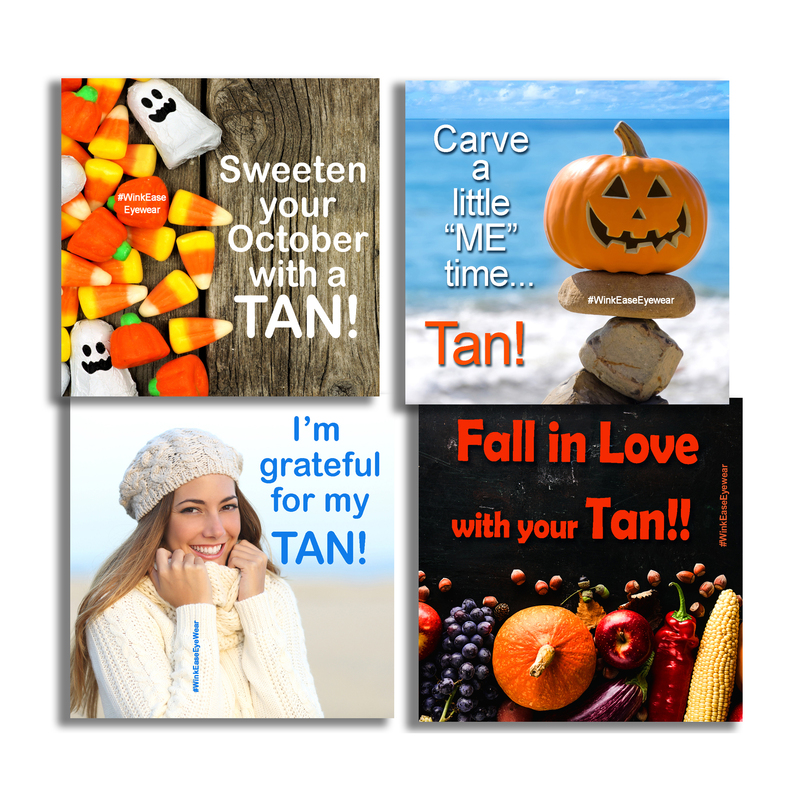 Share Our FREE Tanning Memes on Social Media! October 2018 – Eye Pro, Inc., world leader in disposable eye protection for indoor tanning and makers of Ultra Gold WINK-EASE, Lash Room WINK-EASE and WINK-EASE Dark, is offering fun ads for salons to use to promote their pro-tanning presence on social media. Comments Off on Share Our FREE Tanning Memes on Social Media! Beach Bum Tanning & Airbrush Spa is the leading tanning salon chain on the East Coast, with over 40 stores in New York, New Jersey, Connecticut, Virginia and West Virginia. Beach Bum is one of the first salons estab- lished, having been in business for over 30 years. And, most of their management team has been with Beach Bum for over a decade. I spoke to the beautiful and hardworking Vanessa Pace, Director of Operations, con- cerning Beach Bum’s eyewear policies. She’s been very involved in Beach Bum’s growth into airbrush tanning, infrared services and lash extensions, in addition to UV tanning. “At Beach Bum Tanning, cleanliness and sanitation are critical. Since we expect our guests to ‘get naked’, we focus on keeping our salons spotless!” Pace enthuses. 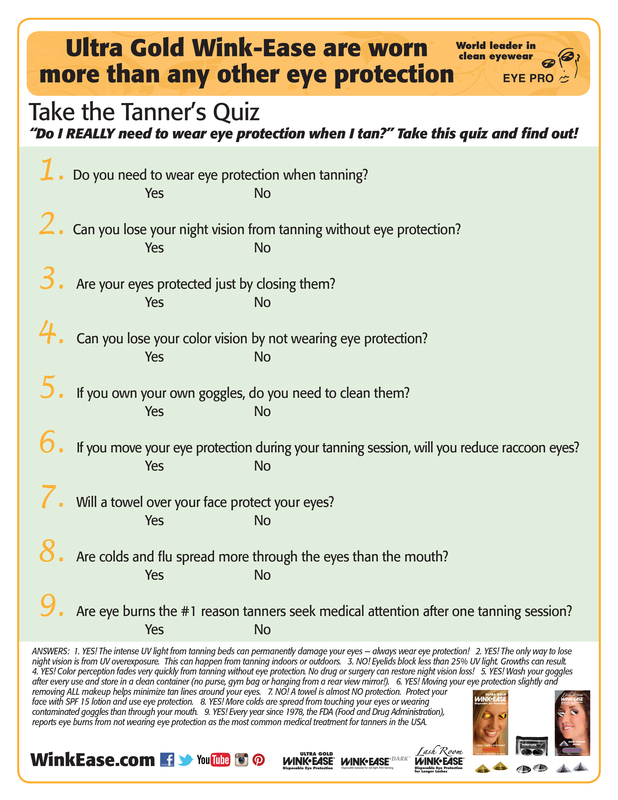 SEPTEMBER 2018 – Eye Pro, Inc., the world leader in disposable eye protection for indoor tanning and makers of Ultra Gold WINK-EASE, Lash Room WINK-EASE and WINK-EASE Dark, isn’t just interested in protecting the eyes of indoor tanners from UV rays, but is serious about eye protection in the spray-tan environment, as well. Comments Off on Spray-Tan Techs Need Protection! I recently chatted with Lance Don- nelly, President/Owner of the Tan Republic Franchise Company – the largest salon chain in the western U.S., with 65 stores and growing. They are now located in Oregon, Washington, Nevada and California. AUGUST 2018 – EYE PRO, Inc., world leader in disposable eye protection for indoor tanning and makers of Ultra Gold WINK-EASE, Lash Room WINK-EASE and WINK-EASE Dark, is all about providing fun and easy eyewear information to you AND your tanners! 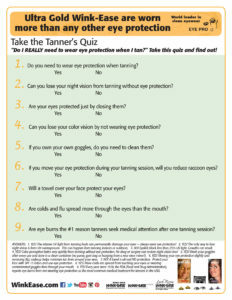 Comments Off on Wink-Ease Offers FREE Tanner’s Quiz to Help Educate Your Staff and Tanners! I was surprised to learn that a ton of middle-aged folks get cataracts, not just the el- derly. Over 22 million people in the U.S. over 40 years old have cataracts. Tens of thousands will lose their sight and millions more will have poor vision because of cataracts, reports the University of Maryland Medical Center. “Ultraviolet light can accelerate the aging process and we see cataracts in much younger people,” says Dr. Mark Kimpel, a retired ophthalmologist, formerly with Mayo Clinic and Indiana University Medical Center. “I constantly tell young people that you might not see the damage now, but it is like sunburn; you are accumulating the damage for later.” Dr. Kimpel, a sunbed user, strongly recommends wearing FDA-com- pliant eye protection during indoor tanning sessions and UV-block sunglasses outdoors. Comments Off on Are You Preventing Cataracts in Your Salon? Summer has arrived and many in the tan biz take a little time off during the slower months to vacation and decom- press. As I checked in with folks around the industry, I’ve heard of some pretty neat travel plans. 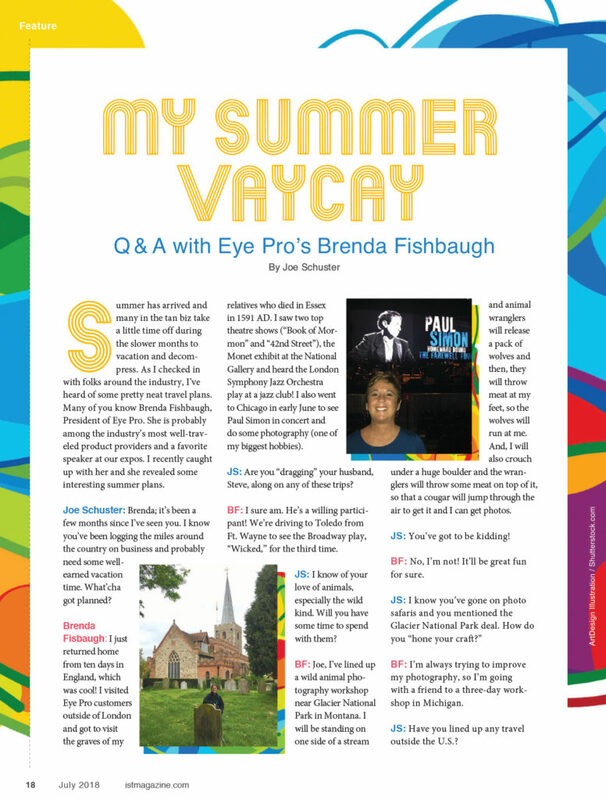 Many of you know Brenda Fishbaugh, President of Eye Pro. She is probably among the industry’s most well-traveled product providers and a favorite speaker at our expos. I recently caught up with her and she revealed some interesting summer plans. Joe Schuster: Brenda; it’s been a few months since I’ve seen you. I know you’ve been logging the miles around the country on business and probably need some well-earned vacation time. What’cha got planned? Consider Eyewear When Offering Sunless! 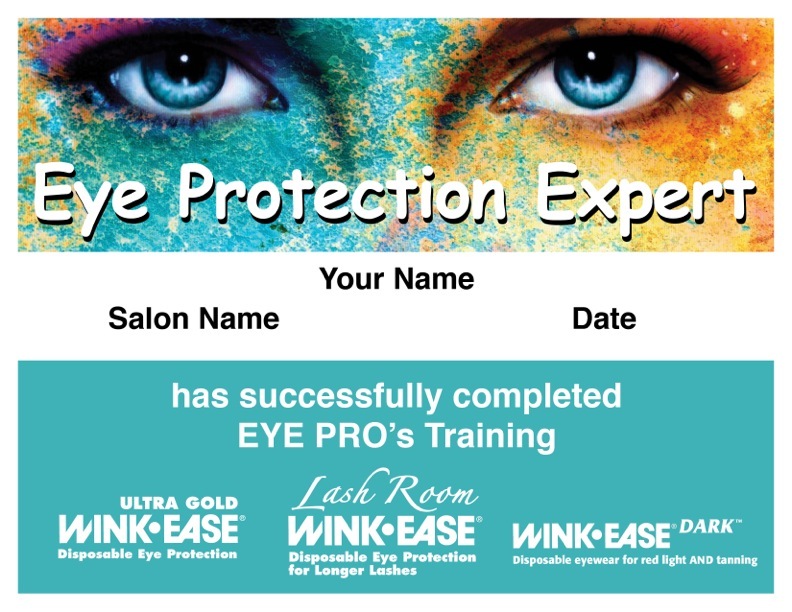 July 2018 – EYE PRO, Inc., world leader in disposable eye protection for indoor tanning and makers of Ultra Gold WINK-EASE, Lash Room WINK-EASE and WINK-EASE Dark, is offering disposable eye protection for the Sunless segment of the tanning industry – for both spray tan customers and spray techs. “Although eye protection is not required by the FDA for sunless tanning, the FDA STRONGLY encourages customers cover their mucous membranes when being spray tanned by a held-held tech or in an auto-booth,” explained EYE PRO President Brenda Fishbaugh. 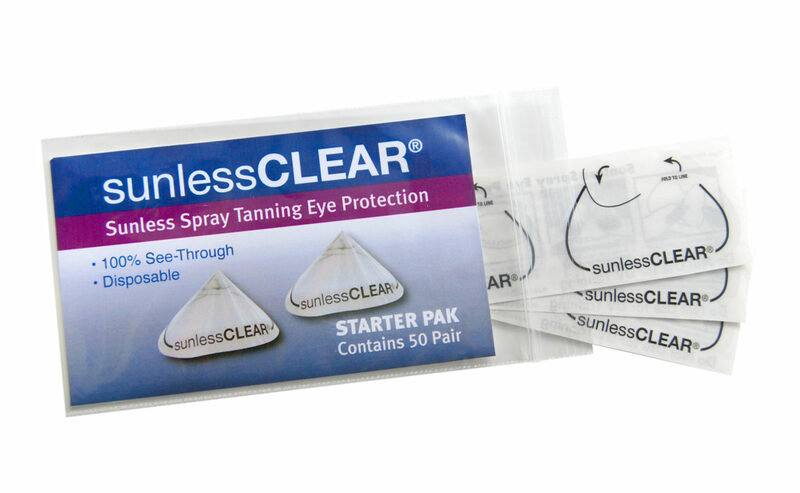 “We teamed up with Sunwest, a Arizona supplier of many sunless products for the salons, and developed an eye protection called Sunless Clear disposable eye protection. 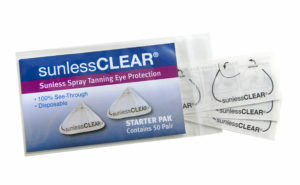 The Sunless Clear disposable eye protection is available in 50-pair packs and 250-pair rolls,” Fishbaugh continued. 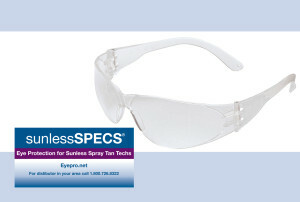 Comments Off on Consider Eyewear When Offering Sunless!